I heard about this at work and decided to check into it. Banks and credit card companies are now using “behavior analysis”. Some people are having their credit limits lowered for shopping at the ‘wrong’ stores. For those who prefer to read, the Atlanta Journal-Constitution has it here. The New York Times covers it here. People shot at Wal-Mart for more reasons than just being broke and unable to pay their bills. Some people want to save money. This, hard to believe, how some people become rich. They are prudent, wise and thrifty. Now some credit companies want to penalize you for being prudent, wise and thrifty. Hey, isn’t that how they got in this big mess in the first place? Yes, they lent money to unwise people, rather than wise people. His experiences have led Kevin Johnson to become an internet activist, and now to run for office. Good for him! The season was fairly quiet. Yes, there had been injuries but there was no drama for the Red Sox this season. It all seemed to leave the team when Manny was shipped to the far side of the continent. There could have been drama with the recent acquisition of Adam LaRoche. Mike Lowell has been presumed to be healthy, but has sat out a few games so LaRoche could play. Lowell was one of the few Red Sox players not in a slump (hitting well over .300 since his return from the DL). He has acted like a pro, and supports the team. He just wants to win, and knows he’ll be playing though his hip affects his defense (and base running) far more than his hitting. LaRoche provides the insurance the Red Sox needed so they didn’t have a repeat of last year’s playoffs. You have a healthy Mike Lowell, and the Red Sox are going to the World Series (sorry, Rays’ fans). But the tranquility came to an end during a prime time for Manny Moments over the last few years. Only he’s gone. So Dice-K decided to fill the role. I suppose he has too much time on his hands. Afterall, he is no longer able to throw every day. Just prior to the trade deadline, Dice-K decided to complain to the Japanese media that the Red Sox don’t understand him and his training methods. His shoulder problems are not due to missing Spring Training for the WBC. He claims he has stunk this year because the Red Sox have not permitted him to maintain his training regimine. This, he explains, is why Japanese pitchers have a substantial drop off in performance after 2 years. Japanese players are different, and apparently that includes physiologically. Now we have a “war of words“. The timing of this is really quite horrendous. Theo has other matters in mind. He’s trying to improve the team. With John Smoltz looking like this year’s version of Dice-K instead of any year’s version of John Smoltz. Maybe this explains why the Red Sox have been rumored to be looking for starting pitching. Theo doesn’t like distractions (neither does John Henry). Dice-K may want to take a few of those words back or he might end up in Cleveland or Toronto. The Red Sox’ pitching program apparently works for everyone but Dice-K. That’s how bad it is. Injuries have a way of messing with a player’s mind. They aren’t able to focus on the things they usually focus upon. They start to think too much, they miss the attention and blow a bearing. This is how I understand this as it begins to play out. But if Dice-K doesn’t get a hold of himself, this could begin to play like Rocket Roger’s complaint about having to carry his own suitcase. Dice-K does not realize how diffcult Boston can be if the fans turn on you. Should he continue to vent and blame instead of working his tail off and making adjustments (like discovering ways to get guys out in less than 10 pitches per at bat), they will turn and it will be ugly. He is used to adoration. And the Red Sox may have to ship him someplace less glamorous, less likely to see post-season action. I don’t think he wants that. Update: I guess I will now call him Diva-K. Tony Massarotti has an interesting article about this. Apparently the Diva act is wearing thin (hmmm, we could also call him Pedro-K but he’s nowhere near as great a pitcher as Pedro was at his peak). Now that he’s not winning he’s accepting no blame (like for showing up overweight and out of shape as if he’s David Wells), but all the credit for those 18 wins (since the bullpen worked nearly 50% of the game they deserve some credit). Apparently the Red Sox staff is livid, and I think they should be. Tony mentions how adversity reveals one’s true character. Ain’t looking good for Diva-K right now. A few friends planted a church and wanted to instill some good gospel DNA. But they found the small group material unsuitable for their purposes. So, they turned World Harvest Missions materials into a 9-week study appropriate for both immature Christians and non-Christians to ground them in the Gospel-Centered Life. Soon it was bearing great fruit in their ministry, and others were using their materials. Now they have partnered with World Harvest Missions to make their material widely available. You can even get a free sample from WHM until 7/31/09. Maybe God will use it to change some lives, including yours (and mine). It has been a busy day for the Red Sox front office as the trade deadline draws near, and the Sox are mired in an offensive slump. I’m not saying anything needed to be done, but they have not been playing well and have relinquished the AL East lead to the Yankees. The Red Sox plundered the Pirates again. I think I might prefer the players the Braves got from them, but Adam LaRoche fills the need they had. That need is two-fold. They needed a left-handed hitter with some power. Mark Kotsay is not to be confused with a guy with power. Kotsay did a great job filling in at first base when Lowell went down in the playoffs last year. But the Red Sox needed some power in that line up. He enables them to platoon a guy with power with Mike Lowell who continues to struggle with a bad hip. They gave up 2 prospects that were quite unlikely to ever crack the Red Sox’ line up. They might make the Pirates’ line up though. Argenis Diaz made some very flashy plays at short, but often blew routine plays and hit a tad better than Alex Gonzalez. The Red Sox have two other prospects with far better chances of playing SS in the big leagues, one of the their Dominican players and a recently signed Cuban player. Hunter is perhaps a #4 starter, which we really don’t need. The big news is that they actually got a warm body for Julio Lugo. The Cards, in desperate need of warm bodies in the infield since Pujols can only play one position, took him. They won’t pay any of his salary. I like the symmetry of this. The Red Sox’ revolving door at SS started when they did not re-sign Orlando Cabrera after the landmark 2004 season. Instead they signed the SS for the Cards who made the final out of the 2004 World Series who is now known as Rent-a-Wreck since he played so miserably for the Red Sox that they promptly traded him to Atlanta after the 2005 season. I think this is the final year of that deal, so they won’t be paying him anymore after this season. Then we had the great fielding, but light hitting Alex Gonzalez who is also known for getting hurt (though not as much as Pokey Reese). He was warming the seat until Julio Lugo was a free agent. Theo promptly paid him $9 million/year, and we have suffered ever since. He has not hit for anything resembling the power he displayed elsewhere, and had a knack for making errors. His injuries paved the way for Jed Lowrie who rarely made errors and showed some power until injuring his wrist. With his wrist surgically repaired, Lugo ran out of time. Of course, it wasn’t like he was playing. Throw away Nick Green has been playing solid defense (though mired in an ugly Lugo-like slump). Lowrie can now platoon with Green until he’s ready to resume his role as starter, hopefully providing some good offense to go along with his solid defense. So, the Red Sox have dealt with some of their issues as they struggle through the middle portion of the season. Clay Buchholz makes his second start as Wakefield rests his back. Plenty of people anticipate Penny being traded (prospects?) should Dice-K get his shoulder strong enough to pitch effectively again. If he doesn’t, they can still trade Penny and keep Clay in the majors. He worked out the kinks in his delivery, and his mindset. Now it is time to take back the East from the Yankees. During my teen years, my greatest love was the Boston Celtics. I was enamored with Larry Bird, Kevin McHale and Robert Parish- in a manly sort of way of course. The Red Sox had cooled off after the debacle of 1978. The Big Three captured the heart of New England, selling out the venerable Boston Garden for years on end. I had many fond memories of the Boston Garden. I recall seeing Parish there when he was still a member of the Warriors. I hated being up in the nosebleeds, fearful of falling down those steep cement steps. But my father often had tickets during those years as he courted customers. I was an occasional tag along. Including the magnificent 1984 Eastern Conference Game 7 versus the Knicks. So, the other day i was in the local library looking for some non-fiction and saw Peter May’s book The Big Three. It was time to relive part of my youth. But it was much more than that. I learned alot about how the NBA used to be. It is astounding how different the NBA is today. I’m not talking about the style of play. I’m talking about free agency, the draft and more. All of these things mattered, setting up both the rise and the fall of one of the greatest frontcourts in all of NBA history. In the late 70’s and early 80’s, when you signed a free agent you had to pay the other team compensation. This was negotiated, and a master negotiator got the best end of the deal. Red was a master negotiator, often getting the best end of the deal. It was these types of deals that set them up to trade down to get McHale and Parish. It was the strange trade rules that prevented Boston from trading any of them away, crippling the Celtics just like Bird and McHale suffered crippling injuries that stifled their careers in what should have been their prime. Trading Bird would have been like trading Ted Williams or Yaz. McHale, maybe, but those rules meant that there was no way they could get what he was worth. So, Peter May provided some very interesting background to the game, and the players. He had chapters on each of them. Not as in depth as a biography, but certainly the high points and their development as players. Oddly, both Parish and McHale attended schools that spent the duration of their college careers under probation. Their time together as starters was too short thanks to Bird’s back (well, his heels first) and McHale’s ankles. One can only imagine what might have been if those injures had not seriously curtailed their abilities on the court. The 1980’s were a transitional time in basketball. The resurgence brought about by Bird and Magic initiated numerous changes in the industry. Salaries soared. The draft became serious business (prior to this they never even brought in players for interviews). During their period of dominance, the game change on and off the court. I’m not a big fan of Peter May. But this book is a good one, filling in many of those gaps that existed before the incredible transformation of information accumulation resulting from the internet. This was a time before bloggers (including Celtics Blog) and access to 24-hour news stations (ESPN was just getting started). I’m glad he put much of this down for people like me to remember, or learn for the first time. 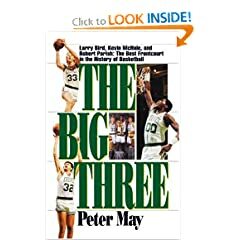 Any fan of the NBA, and especially the Boston Celtics ought to read a copy. In this day and age ministry has become more about systems, programs and administration than it was in centuries gone by. Sometimes we need to re-assess. One way to gain a bit of historical perspective is Peter Beale’s translation of Martin Bucer’s book on pastoral ministry called Concerning the True Care of Souls. Bucer was one of the Swiss Reformers in the 16th century. He spent most of his ministry in Strasburg. It was there that John Calvin, booted out of Geneva, spent his time until the city elders came to invite him back. He learned much about pastoral ministry from Bucer. Later he would accept the invitation of Thomas Cranmer to go to England, teaching at Cambridge. He begins this theology of ministry with short chapters on the nature of the church and Christ’s rule in His church. This lays the foundation for lays ahead. The next chapter is on how Jesus carries out His pastoral office through ordained ministers. We are to understand Jesus at work among us through ordained ministers for our salvation and well-being. Yes, this despite the faults and frailty of ministers. There is another short chapter on the types of ministers/ministries Jesus uses. After a few more short chapters we hit the core of Bucer’s book- the tasks of ministry. He begins with how lost sheep are to be sought (evangelism). The bulk of the book is taken up with the restoration of stray sheep (church discipline). He then moves on to how the wounded and sick sheep are to be healed (more church discipline), how weak sheep are to be strengthened & healthy sheep are to be guarded & fed (discipleship). He spends so much time on church discipline for a few reasons. He served in the context of a state-church. As a result, there were many church members who were so in name only. Some were obviously lost, forsaking the worship of God. Others were wayward, bearing no fruit of regeneration. There was much work to be done. Imagine if pastors here in America had responsibilities for whole neighborhoods or towns. They would be responsible not just for church members (people who showed up to worship services) but all the people living in the geographical bounds. The second reason he spends so much time on this was because many thought this a “roman” practice. He shows the biblical grounding of church discipline, and distinguishes it from some of the abuses that took place in the Roman Church, as well its neglect among some Protestants. He also draws heavily on the Early Church Fathers. D.A. Carson re-enters the discussion of Christianity’s relationship with culture in Christ and Culture Revisited. I say re-enters because he hits some similar issues in The Gagging of God: Christianity Confronts Pluralism and his more recent Becoming Conversant with the Emerging Church. This time he evaluates the classic, influential work of H. Richard Niebuhr, Christ and Culture. He arrives at the same essential point that I did while in seminary, just in a far more thoughtful and thorough way. Due to my circumstances, it may have taken me as long to read it as it did for him to write it. What Carson does is rightly is say that no one paradigm fits every situation. Scripture reveals very different responses to different circumstances as people sought to live life under the gaze of God. We are to utilize wisdom, always checking our hearts with Scripture lest we deceive ourselves, to chart the best course. In developing this, Carson digs into some good biblical theology. This is so we live in light of the main turning points of redemptive history (creation, fall, redemption, restoration), and in light of the already/not yet realities of our salvation. When we focus on only one or two turning points of redemptive history we fall into reductionism and hover in one (often knee-jerk) response to what is happening around us. Inevitably Christians find themselves squeezed between the claims and obligations of the broader culture and their allegiance to Christ. The tensions between Christ and culture are both diverse and complex, but from a Christian perspective they find their origins in the stubborn refusal of human beings, made in God’s image, to acknowledge their creaturely dependence on their Maker. … Although there are better and worse examples of how these tensions might play out, there is no ideal stable paradigm that can be transported to other times and places: every culture is perpetually in flux, ensuring that no political structure is a permanent “solution” to the tension. It may sound to some as relativism, but it really isn’t. We apply unchanging standards to changing circumstances. So at times we will adopt cultural practices, at times abandon them, at times adapt them etc. It is when Carson begins to examine the various uses of the term ‘culture’ that this book gets a bit heady and philosophical. It is at moments like that when I realize how average a thinker and how poorly read I am. But my calling is different from his. He wisely says you can jump to the next chapter. He focuses a great deal of attention of the relationship between church and state (and how those terms are variously used). In our quest for one ideal arraingment, we err. He traces the development of various views in the West (notably the U.S. and France). We should learn to tread lightly when wanting to criticize Christians in other cultures. We often don’t have the frame of reference, and circumstances, they do. And we often flounder in our own circumstances. I gather we should take the log out of our eyes. Overall it was a good read, but not an easy read. But pastors and elders should labor through that they might shepherd their people through this potential quagmire. I’m glad Carson revisited some old ground and gave us a better lay of the land.